While I was enjoying a lovely day in the sunshine with my girls today, legislation passed Parliament by a single vote allowing the partial sale of four New Zealand state owned companies. How could such a beautiful day have turned so ugly? Especially when, as Green Party co-leader Russel Norman pointed out in his speech on the third reading of the asset sales bill, the majority of New Zealanders voted for parties that don't support asset sales. Unfortunately some of those parties didn't make the 5% threshold to get into government so we've ended up with slightly more parliamentary representatives in favour of the bill. One vote's worth more in favour. 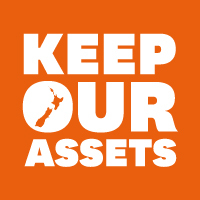 Check out the Keep our Assets website to find out why I think it's a bad plan for our Government to sell up to 49% of Meridian Energy, Mighty River Power, Solid Energy and Air New Zealand. Now for some hope. My name has already joined 100,000 other signatures in a petition requesting a referendum. Look out for opportunities to sign the petition yourself. Volunteers are taking them all over the country. You can even print out your own form here and get EVERYONE you know to sign it.